I've blogged about The Bollo before - it was one of the first reviews I ever wrote on my blog. Since then we've been more times than I can remember, for food, drinks, Sunday lunches, last minute dinners, meetings, cocktails.... It's our regular so we end up there for many reasons or no reason at all. Then you can imagine my horror when I called to book earlier this Summer only for the phone to ring and ring with no answer. They'd closed! During Summer!! But a bit of further investigation led me to find out that it was only temporary as they were undergoing a full front and back of house refurb, and they'd be open again soon. So the night after they reopened we were there like a shot to try out their new range of drinks and updated food menu. The Bollo changed hands pre-refurb and is now run the by the same group who own The City Barge in Chiswick, which is another new favourite of ours, so I was excited to see what they'd done to improve this place we call our second home! A lot is the answer!! I'm so happy that all has changed for the better. The inside of the pub has been given a lick of paint, the slightly odd seating arrangements are gone (it used to be a bit of higgledy mix of bench seating, large tables, sofas and various types of chair) replaced with more tables, creating a restaurant feel in the main dining area, but without having lost any of the pub feel in the bar area. And talking of the bar area, their drinks selection is awesome now. There's about 10 different craft beers, a lot of which are brewed in London, on tap - one of which is a new favourite - 3 Weiss Monkeys - a wheat beer brewed in London Fields which is light and refreshing with a delicious lemony taste to it. We sunk 5 of these between us before we'd even ordered food - oops! If you like wheat beer or are interested in trying it, go for this, it's the best wheat beer I've ever tried. But the main event for me was the food - we loved the old, seasonally changing menu that had our favourite dishes on it which we ate over and over again. I was nervous about the change, but I needn't have been - it is SO good! The menu has been spruced up - bread to nibble that used to be served with oil and balsamic has been upgraded to delicious slices of a seeded loaf, now served with oil and dukkah. Salt and pepper squid is now calamari with merguez sausage - traditional has been replaced by modern with a twist. We started our meal with the chargrilled squid, Calabrian spiced sausage and lemon, and goats cheese and tarragon croquettes, beetroot, orange and shoots. Both were excellent. The squid was punchy, soft, melt in the mouth, and the croquettes were gooey flavour bombs complimented so well by their accompaniments. Another thing I love that they've done at The Bollo is use old magazines to encase their new menus.... As a big cat obsessive I thought mine was quite apt! On to mains and the boy went for the burger. He's had good and bad burgers recently - in fact, he's just had good burgers not necessarily well cooked. He likes it pink, and I think if you are asked how you'd like something cooked then it should come as requested. The Bollo certainly did this, with an oozy, juicy, pink burger in a perfect bun, with a generous slice of smoked cheese on top. I know you can't see the inside in this photo but you'll just have to trust me that it was amazing! I had the braised rabbit leg with haricot beans, pancetta, summer greens and tarragon which was just as good. The rabbit was still juicy and full of flavour (so often rabbit meat is dry and tough but none of that here) and I love haricot beans so it was the perfect combination for me. We couldn't manage pudding but will definitely try some of them out in the not so distant future, I really can't wait to go back and eat my way through the entire menu! 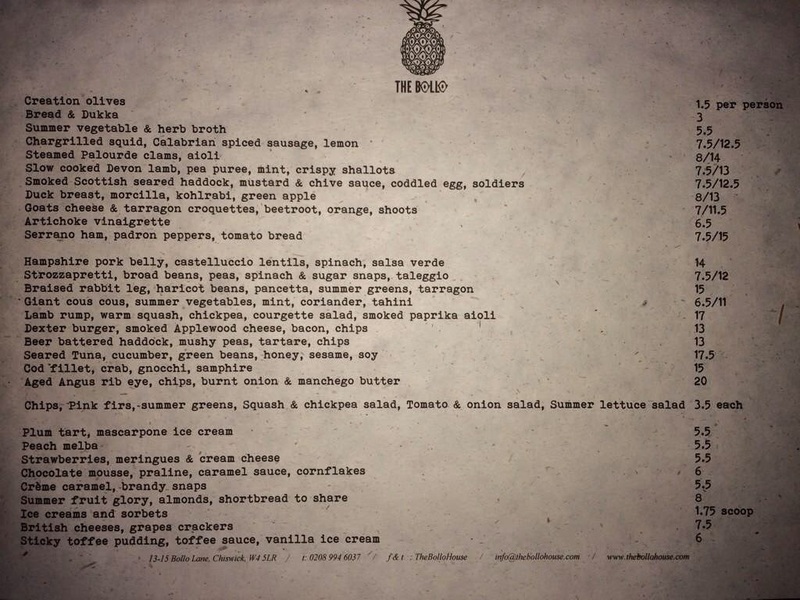 The Bollo is definitely new and improved and I'm so glad they're back with a bang - they are definitely still in my top 5 Chiswick food destinations. It's one of Chiswick's finest. Am really blown away by what they've done and how much they've improved somewhere that I already loved!! I never really go to that neck of the woods so I've never heard of Bollo but it sounds like a great little place! The menu and food both look lovely. Sounds like the refurb was a real success too! Luckily I read this post just after my dinner so I'm not left dribbling too much! That rabbit looks delicious, and the beans sound like a great accompaniment. It was such a great combo :) especially now it's getting cold in the evenings, I love stew style dishes to warm me up!